Origami skulls are easy-to-make Halloween craft for children. With just a few basic folds and some cleverly placed cuts, kids can transform a single sheet of paper into a favorite symbol of Halloween. The skull can be worn as a mask by punching holes in each side and stringing the thread through them to secure the mask on the child’s head. Alternatively, you could glue or tape a flat paint stirrer to the mask so your child could simply hold it in front of his or her face. When Halloween is over, kids can make origami skulls to celebrate the Day of the Dead (Día de los Muertos). This Spanish holiday is celebrated on November 1st and 2nd to honor the spirits of friends and family members who have passed away. The occasion is marked with parades, dances, special meals, and small trinkets left at the graves of loved ones. It is a national holiday in Mexico but frequently celebrated in the United States as well. This project requires a square sheet of paper. To turn an 8 1/2 x 11 inch sheet of paper into a square, fold the upper right hand corner down so the edge touches the left hand side of the page. Fold this triangle over so it touches the right hand side of the page. Fold the bottom rectangle portion upward. Unfold this last fold and cut through the line with scissors to reveal your square 8 1/2 x 8 1/2 inch paper. Position your paper so one of the diagonal creases is directly in front of you. Fold each of the corners in to meet this center crease. When finished, your paper should look like the photo to the left. 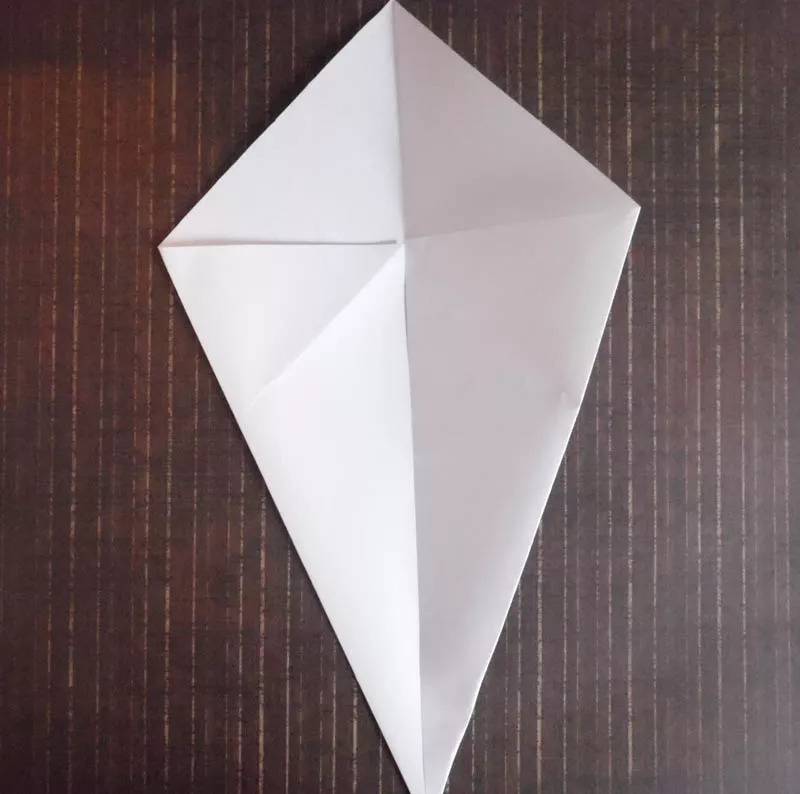 This origami form is known as a kite base. 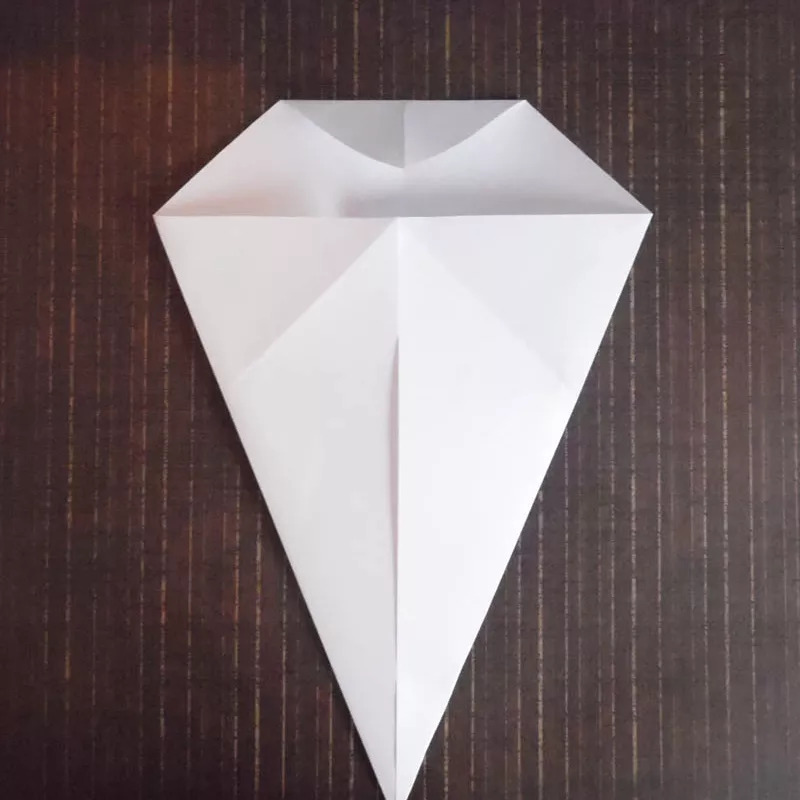 It’s a very common starting point for many origami projects, including a cute little origami ghost or an origami Santa. Fold the top point of the kite base down as shown in the photo to the left. Fold the left and right sides in. Cut two triangles as shown in the photo to the left. These will be your skull’s eyes. Fold the paper in half. Cut a triangle to make the nose of the skull, as shown in the photo to the left. Unfold the paper. Step fold the paper as shown in the photo to the left. This begins the teeth of your origami skull mask. Flip the paper over. Fold the bottom pointed tip up about 1/5 of the way. Fold the tip down, then up, then down once more. This finishes the teeth of your origami skull. If your child does not want to wear a mask, you can place small bits of colored tissue paper over the cutouts and use it as a window decoration.